The Duct tape is suitable for all mechanics and fitters. Repairs and fixings are solved easily and quickly. The tape is reinforced in the longitudinal direction, thereby a very high tensile strength is achieved in the longitudinal direction. Transverse to the tape direction, the duct tape can be easily torn by hand. It is very strong, waterproof and cuddly, but can not be removed without residue from most surfaces. This versatile tape is used in daily use as a temporary repair tape and fixation. 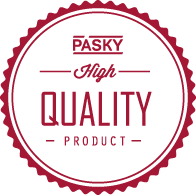 We are happy to help you find products that are tailored to your specific needs!